I bet Cesca wanted to or is gonna start her post with this song hahaha. a gift from my coworker. She went to Guam! Well, on Monday school started for me, but it turned out to be a super short day. Over the August break, the government suddenly declared the 14th a red day, because the Liberation Day holiday fell on a Saturday but they thought people should get time to celebrate it. I was already on vacation when this was officially decided, so I said "meh, I lose that vacation time. No big deal." But when I went to work Monday, my co teacher started making phone calls and told me that, because I had extra vacation time because of the holiday, I could leave early! I was home by 11 o'clock! It was awesome and everyone was jealous. It gave me some much needed alone time to clean up my apartment, do my Korean homework, nap, and go to the bank to fix a problem with my bank account (THANK GOD). I also got to chill by myself, which, for an introvert like me, was wonderful. I love my office but I was not ready for the chattiness of post vacation Monday. This same co teacher also forgot to inform me we had drama club practice Tuesday morning, but I thankfully was already at school (I'm an early bird) and I was already prepped for my lessons, so I just had to roll with it... Can't win them all! It's a busy week for her, too, and this club is stressing her out big time, so I can see how she forgot to mention it to me. I'm caught up on our schedule changes now hehe. It was the start of the semester, but since it's the middle of the year, it's less hectic than March and so we got back in to classes right away Tuesday. Not wanting to start the textbook, I played MASH with my 6th graders and I ended up married to G Dragon, Brad Pitt, Captain America and a good number of my students. A lot of my boys ended up married to Park Geun Hye, the president of Korea, so that was pretty hilarious. It was a fun day! The rest of the week passed in a blur of Korean class (where my British classmate and I explained many difference between our English to my teacher), regular class with my students, and rehearsal for our dance performance on Saturday! I did a nice thing on Friday as well. Koreans tend to treat coworkers and friends to things when good stuff happens in their lives, so on Friday, with Young Ah's help, I ordered coffee and smoothies for everyone because my new contract started Tuesday. I'm living happily in Korea and having a great time at work, thanks in large part to my awesome office mates and especially my co teachers, so even though it was a small gesture, I'm glad I could do it and participate in the culture a little bit more. Why am I not home to compete on this show?? The highlight this week was the weekend (isn't that just the way?). We've been prepping for a little while, and we practiced together Wednesday and on our own all week. By Saturday, we were excited and nervous. We got to the club early and did our makeup in the coffee shop next door. Then we hung around before the show and got nervous but excited. Our friend Helen came to see us! We performed twice, once in the club for our friends, and once in the playground in Hongdae, which was super scary because it's a big gathering place for people before they hit the town, so it was very crowded. 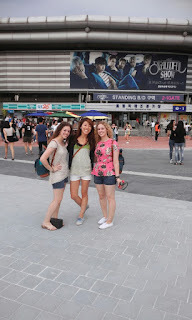 It was super fun though, and we got a lot of attention, as foreigners and as girls wearing matching short skirts haha. because we're so obviously not. Young Ah and Hae In even came out and saw us dance! Getting ready for our dance in the club. We killed it. I'm so glad I could finally invite her to a performance! Usually I have nothing to show her! I'm sad the performance is already over, because we practiced a lot, but it was so fun and I'm so glad we did it. I have little to no confidence in talking to people usually, but for some reason dancing and performing is totally different and I can finally show some confidence in an area. It was stressful to prep for it, but it was sooooo worth it. As if that wasn't awesome enough for one weekend, we had another highly anticipated event on Sunday. Cesca's been itching for this for a while, because we FINALLY got to see her favorite Kpop group, Beast/B2ST, live. I think they're one of the last groups I'd really wanted to see live as well, so I was also super stoked about seeing them. 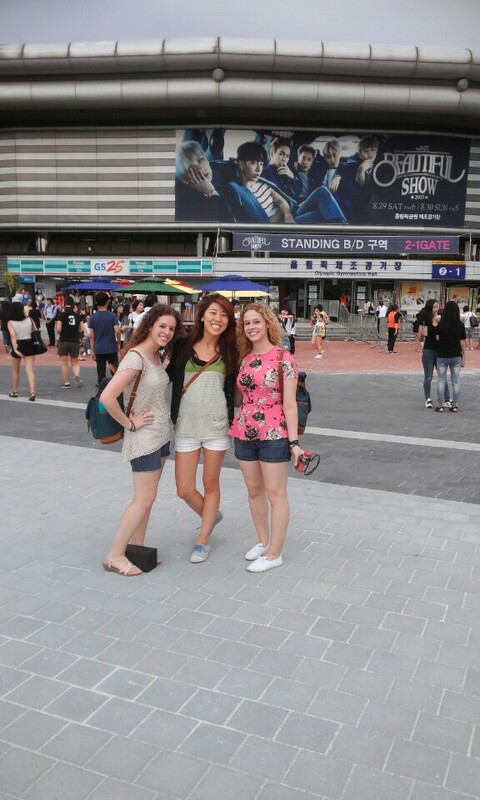 We met up with Grace (from our dance group) and her bf and headed out to the concert across town. 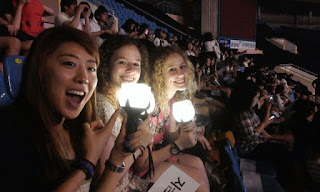 ready for the show with our lightsticks! The funniest part of the concert was that Hyunseung had obviously only recently dyed his hair, so while he was sweating it kept running down his face and getting all over. Later, when the members were expressing their gratitude, most of them were full of emotion. Hyunseung said "I'm so touched and grateful that my heart hurts and is bleeding! Do you see the blood!" to make fun of the streaks of red running down his face. It's definitely more fun when I can kind of understand some of the things they say during the talk breaks. They did most of my favorite song and had a good mix of ballads and fun stuff. It was a great concert, but they got really emotional at the end and we were worried cause we didn't know what was happening. I ended up asking some girls on the subway and they said they were moved by the fans tears and dedication even though the members have been working apart lately and their comeback took a while. We were worried someone got called for their military service or something! Nope, just happy tears and appreciation. Now I'm home and wound up from a great weekend, but I'm not sour about Monday. This is my 3rd fall semester in Korea, and I know that, with some of the breaks, it's hectic but also much less of an annoying stretch than spring, so I'm looking forward to it. In other heartbreaking song news, Beast's On Rainy Days has been in my head since the concert. It's so pretty and sad~~ They're sooooo good live, and it was great at the concert. This is a vid from earlier in the year because the concert vids aren't up yet.